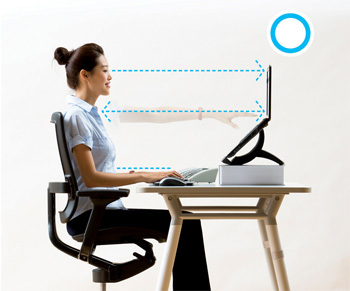 Your monitor should be positioned at approximately arm’s length from your usual seated position for visual comfort. The top tool bar of the screen should be at approximately the same height as your eyes. 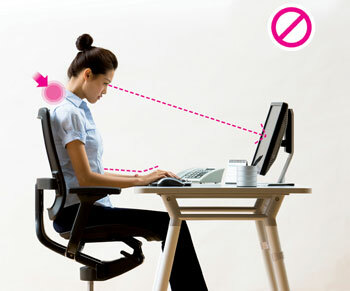 – If it is too low, you may be at risk of developing neck pain from looking down at the screen. – If it is too high, it can cause both neck pain and eye strain from looking up. The monitor should be angled vertically to avoid glare on the screen from overhead lighting. Your monitor, keyboard and mouse should be positioned directly in front of you on your desktop, in a straight line with your shoulders. – If you place them on an angle, you are at risk of developing one-sided neck and shoulder pain.